For temporary relief of minor aches and pains of muscles and joints associated with simple backaches, arthritis, bruises, sprains and strains. 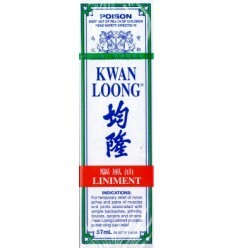 Kwan Loong Liniment provides penetrating pain relief. Ingredients: Methyl Salicylate 15%, Menthol 25%, Spike Lavender Oil 7%, Camphor 10%, Eucalyptus Oil 10%, Light Liquid Paraffin 33%.